(T.I.1) on QV 1d CC wmk (SG.66). (T.I.1) on QV 1d CA wmk (SG.99). 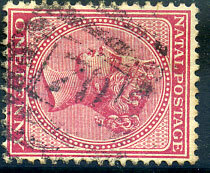 (T.I.1) on QV 1d CA wmk (SG.99a), milder perf. toning. (T.I.1) on QV 1d CA wmk (SG.99a) piece. (T.I.1) on QV 1d CA wmk (SG.99a). (T.I.1) on QV 1d CA wmk (SG.99a), perf. toning. (T.H) on QV 1d CA wmk (SG.99a). (T.H) on QV 1d CC wmk (SG.66). 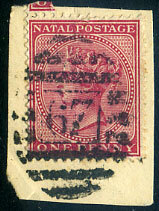 (Type H) on QV 1d CA wmk (SG.99a), small closed tear lower left corner. (T.G) on QV 1d CA wmk (SG.99). (T.G) on QV 1d CC wmk (SG.66). (T.G) on QV 1d CA wmk (SG.99a), perf. fault. (T.G) on QV 1d CA wmk (SG.99a). (T.G) on QV 1d CC wmk (SG.66), thinned. (T.G) on QV ½d (SG.97a), minor toning. 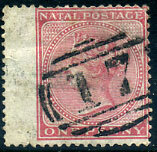 (T.G) on QV ½d (SG.97a), slight thinning. (T.G) on QV 1d CA wmk (SG.99a), some paper wrinkling. 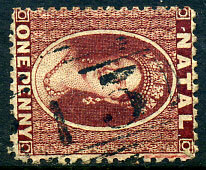 (T.G) on QV 1d CA wmk (SG.99a), toned corner perf. (Type H) on QV 1d CC wmk (SG.66). (T.G) on QV 1d CC wmk (SG.66), light crease. (T.G) on QV 1d CA wmk (SG.99a), creased. 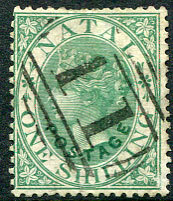 on 1863 QV 1d lake No wmk (SG.18). (T.G) on 1867 QV 1/- green CC wmk (SG.25, Cat.£48), smaller faults. (T.G) on QV 1d CA wmk (SG.99), corner perf. toning. (T.G) on QV 1d CC wmk (SG.66), perf. faults. 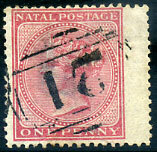 (T.G) on 1861 3d blue No wmk (SG.12, Cat.£40).